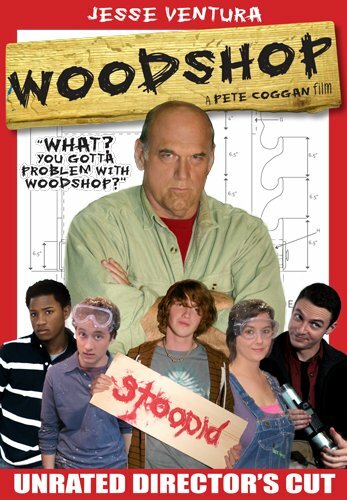 While it never manages to escape its John Hughes inspired roots as an obvious twenty-first century send-up of Hughes' quintessential high school dramedy, The Breakfast Club, writer/director Pete Coggan's Woodshop is undeniably bolstered by an expectedly tough but unexpectedly tender surprising turn by former Minnesota governor Jesse Ventura. Following an accidental chemistry lab explosion that garnered valedictorian Chris Johnson (Scott Cooper Ryan) his sole “F,”the school principal negotiates with the Harvard bound student by giving him a Saturday detention in woodshop class to heal the one blemish in his otherwise flawless GPA. Hopeless with a hammer let alone a table saw, even though his best friend Trey (Jonathan Davis) is with him in shop, Chris underestimates how many obstacles he'll have to face during the course of one day. Instead of long heart-to-hearts a la John Hughes, Coggan utilizes everything from flashbacks to text messages to paint us a much clearer picture of the large ensemble cast we'll encounter throughout the succinct eighty-nine minute work by trying to flesh out as many characters as he can. And regardless of the fact that he's only successful in basically endearing just one or two to us as Chris comes face-to-face with the initially odd classmates whom he realizes he used to know under much different circumstances years earlier, Coggan admirably reminds us of a terrific truism about high school in that we're all still connected to the people we've grown up with regardless of which cliques they hang with now. Even though there's hope of reconciling with some forgotten friends, it's not the case with everyone as Chris attempts to steer clear of a maniacal bully (Ross Marquand) whose hatred of their ex-Army Ranger shop teacher Mr. Madson (Ventura) threatens to reach explosive levels by the end of detention. Moving from an overpowering performance to dominate the unruly kids to a more sensitive one in recalling a battle story to distract and encourage a wounded student, Ventura's Madson is easily the most fascinating and fully realized character onscreen. This is in stark contrast to the kids as unfortunately, Coggan's lead falls into the bland good guy trap wherein Chris soon becomes the weakest link in the onscreen chain given the fact that aside from wanting to obey the rules and go to Harvard, there's nothing particularly interesting about him aside from a manufactured and tonally awkward action movie plight near the end of the movie. Of course, Chris is perhaps the most relatable character in the piece but in terms of trying to tell the story in a more memorable light, seeing the same events through the eyes of the conflicted Trey or the surface level stoner kid Goldstein (Keegan Ridgley) who actually has many hidden layers may have been the right way to go for Woodshop to do more than just coast by on a “C” average. And obviously to unite the diverse characters, there needed to be something to bind the kids together and the fight against a violent student works well as a convenient fall-back, particularly when the work is set in the same state that has attempted to bounce back from the Columbine attack over a decade ago. However, the dubiously cavalier handling of the concept of a character wanting to kill his teacher left me with a bad aftertaste regardless of the cookie cutter fantasy conclusion that finally gave him his comeuppance. For despite the enjoyment of seeing teamwork and a smart group of outsiders band together, the rushed third act that involves explosives, death threats and terrorism jokes took the movie in a far more darkly comedic direction for which Coggan had set us up and is therefore unable to fully carry out in a way that makes the movie feel as cohesive and balanced as it should. Nonetheless, Coggan’s talent promises that he’s someone to watch in the future and despite some inconsistencies as well as contrivances, it was refreshing to see a high school dramedy that isn’t completely fixated on the prom, losing one’s virginity or trying to become the most popular kid in school.